Wow, where does time go? It’s already been two weeks since our panel on Networking with Local Breweries, Distributors, and Retailers, and I’d intended to do a follow-up post in a timely manner. Things learned: I’m no dynamic speaker. I already knew that, but now about 120 beer bloggers also know. But I’ll always speak from the heart and share as much as I can. 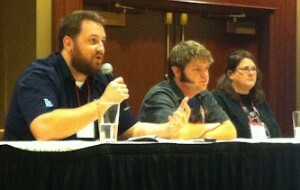 The boys (Randy & Jay) on my panel were much more vivacious, engaging. And their portfolios? Jay Ducote is a total foodie and has created his own niche business using the brand name of “Bite and Booze.” He’s a radio talk show host, a Louisiana food & beer blogger, and a Top 100 MasterChef finalist. Randy Clemons works for Stone Brewing Co. He’s also a total foodie, a social networker, and an accomplished writer with books like The Sriracha Cookbook and The Craft of Stone Brewing Co.
Me? I’ve been a beer store owner and shopkeeper for nearly 6 years. I’ve been an educational and marketing writer since 1993. What I’ve written are ghosted and industry-specific. I feel I have little credentials when sitting next to these two guys. Together with my husband, I started a specialty beer store that’s won “Best Beer Store in Western Washington” three years in a row. My store and its tasting programs been recognized in national and industry magazines such as Mutineer, MarketWatch, Modern Baking, and DBBB’s Beer Trends. But even with those credentials, I am humbled by these two boys, their accomplishments and dynamic personalities. What I have to offer beer bloggers is my knowledge of real, everyday retailer-customer connections. I know what the customer seeks; I talk to them every day (even on my day off I’m answering questions via email). I know what they don’t understand about the beer industry. What they don’t know about beer… things that make sense, things that are confusing. What sells, what doesn’t. I know how bottle placement and organization can trigger or repel sales. I help guide people on their beer journeys. I realize there are so many areas where we, as beer bloggers, can better promote and inform about this delicious product: Craft Beer. My daily job… I’m a beer pimp. 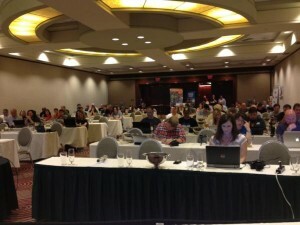 As a retailer, my primary desire for networking with beer bloggers is the goal of creating an educated beer drinker. It’s a challenging prospect, considering the bulk of misunderstandings about sought-after beer have to do with laws and economics. How does one make an educational topic entertaining, engaging, and encouraging? Most consumers think of beer as any other product. Even though they’re asked to present a form of valid identification at time of purchase, they don’t give much thought about the laws regulating their favorite drink, beer. Can you get (insert beer name here) ? There’s a rare/hot release beer that they’ve read about in a beer magazine or online. A beer geek friend has been talking about this beer being the greatest thing since sliced bread. They drank the beer when they were in the service, years ago in Germany or some other exotic locale. They’re looking for a beer they had on vacation in a foreign land…or state. The average beer drinker doesn’t realize that the “United” States of America is not united in its beer laws. Each state is different, and sometimes, each county or even city-by-city have different laws on alcohol, on beer. The average beer drinker may read about strange beer prohibitions in Illinois or Pennsylvania or Mississippi and believe that it also applies to their home state. They get confused. But I don’t blame them. There’s a ton of different laws out there. I’m navigating within just one State’s constraints and just that can leave me scratching my head. I do know this: The average beer drinker has no idea about their State’s alcohol restrictions. Most drinkers think of beer as just another food or product. They don’t think of it as a controlled substance. Washington State drinkers have it pretty good in comparison to a lot of other states. Here, both in- and out-of-state breweries can license to self-distribute to retailers. And retailers can license to receive direct-shipments. 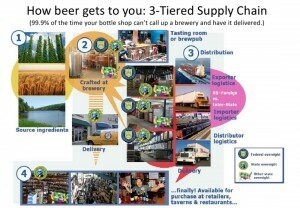 But it isn’t always cost-effective or smart for a brewery to self-distribute. For example, if the brewery’s beer is in low demand, it’s not always worth their dime or time to send it in. Can you get (insert beer name here) for me? Beer is a controlled substance. This means a retailer can’t just call up a brewery and say, “Hey, can I buy six cases?” and have them shipped in for customers to purchase. As a retailer I can’t just rent a big ol’ U-Haul and drive around state-to-state filling it up with beers that my customers are asking for. Because I’m a seller of a controlled substance, there are laws I’ve got to obey and monthly reports I must file if I want to keep my license to sell my favorite beverage: Beer. Retailers who circumvent the system and its laws are treading in the illegal category of sales called bootlegging. Though I’m aware of many who overstep the lines, this is something between them and the State. My concern comes to forefront when I’m accused of being a “LIAR” after I tell people, “Sorry, I can’t get that beer for you as it’s not available in Washington State.” Despite their insistence of seeing it advertised by another business, if it’s not legal here, I won’t make efforts to get it because it is unlawful for me to do so. I am licensed to sell only legally available beer. I really have a hard time with accusations of being a “liar,” because I try my darnedest to be a fair, honest, reputable business person; to obey the laws. Beer’s a controlled substance that falls under all kinds of laws. I can’t find much information on the Web about the topic of bootlegging, other than Modern Day Moonshiners, and I’m not really sure how most beer drinkers feel about buying illegal product. It’s an area that I know a lot of beer geeks and beer bloggers have seen things going on, but all keep mum. No one wants to be a whistle blower. I don’t blame them. I once spoke out about the practice of bootlegging in a blogpost (removed due to controversy and threats) and on my facebook page. The result? Two trumped-up complaints filed against my business with the Liquor Control Board. At the same time, a fellow beer store owner who also spoke out on facebook about the illegal practice also had complaints filed against their business. Clearly as a business owners we can’t speak about the goings-on in our own industry. Though Prohibition ended more than 75 years ago, this didn’t mean beer was put into a “free market” scenario. What the 21st Amendment did was give state and territory individual responsibility over how alcohol was to be controlled. A result was also the Federal Alcohol Administration Act, created to regulate the alcohol industry through an agency called the Alcohol and Tobacco Tax and Trade Bureau (TTB). With the ability to control and regulate alcohol within its borders, each state set up an Alcohol Control Board (ACB). So, with all these layers of regulation, and the inability for a retailer to bring in whatever’s being requested all willy-nilly, how can the average beer drinker get the beers they seek? If they want to get it via a local retailer, it means they won’t be able to get everything they seek. There are a lot of laws for retailers to follow because we’re selling a controlled substance. If it’s a beer from outside the state, it’s considered an “import” into that state. This means it has to go through State ACB approval. If it’s a beer from outside the country, it’s considered an “import” into both The United States (TTB approval) and the state (State ACB approval). The regulations are primarily there for purposes of taxation and temperance. Direct-ship from a retailer, producer, or individual… Some states and counties have pretty strict rules about shipping in and this is where laws really fall apart in today’s society where shopping online is commonplace. Wine Spectator magazine has an article on Shipping Laws State-By-State; though written in 2005 it’s still relevant today and much of it can be applied to beer. Most retailers and producers won’t ship if its unlawful for them to do so, but some will ship into limited states and place a disclaimer on their site that says the purchaser is required to pay taxes to their state. …I’m not sure if you’re familiar with the Jenkins Act of 2007, but it was enacted to make sure taxes were collected from online cigarette retailers. My state, Washington, was especially pissed off. Their smoking residents were avoiding high sin taxes on their cigarettes and cigars by buying online, so they turned to the Federal government to go after online retailers who were selling/shipping across state lines. We don’t yet have a Federal Act approved to allow states to go after online alcohol retailers, but it’s close. And it’s name? Oh, you’ll like this: The CARE Act of 2011. The bill is In Committee now, so get familiar with it. And be sure to make some noise if you disagree. As a retailer considering shipping, I started checking in with State ACBs. I’ve still never checked in with all ACBs on their individual licensing requirements, as I was simply going state-by-state as requests for shipping came in. Some of these beer drinkers looking to get direct-ship of delicious craft beer live in states where annual licensing fees are upwards of $600 for a retailer like me. At 30% operating margin, that’d mean I’d have to sell about $2K of beer into their state just to pay for the licensing fee (no profit). Two-thousand dollars worth of beer …that’s a LOT of beer! So, I abandoned this exploration of shipping cross-state lines, for now. So, how can beer drinkers get the beer they seek? The most common reason a beer isn’t available is there simply isn’t enough supply — or demand — for the brewery to quantify the costs and labors of making it available there. And if there’s no online retailer to ship it to you, how can you get that special beer you seek? Online beer trade forums. Travel — personal or friends who transport it personally. The black market of eBay. As a beer blogger, how have you experienced and enjoyed beers that aren’t available in your locale? Of course, there are many more questions that the average beer drinker asks. But those top two are clearly in need of online topics to help them as they search via Google or Bing. As I’ve just run out of time, stay tuned for a follow-up post with a list of questions… ideas for your beer blog topics. Gotta head to the store, answer questions, and sell some beer!